There are probably a lot of reasons why I see this type of interaction so often between a pastor who is wanting to use a boost and a more "knowledgable" person who is advising them against the boost. Oftentimes the more "knowledgable" people aren't actually more knowledgable; they are just more experienced or wired in a way to love seeing the metrics and analysis in the larger Ads Manager interface. There are also a lot of paid courses and contractors who would advise pastors against boosting, because they would welcome the opportunity to contract with the church or to teach the pastor in a paid course about the more robust (and intimidating) interfaces like Power Editor and Ads Manager. There isn't anything wrong with helping pastors learn the more advanced Facebook Ads features, and there isn't anything wrong with a pastor who desires to learn the more advanced side of Facebook Ads. What I want to do here is clear the air for all of the other pastors who are being told to use Facebook Ads for their church, and somehow have been made to think that a Facebook Boost does not qualify as an effective use of Facebook Advertising. I also just want to take a moment to step back and appreciate how amazing the Facebook Boost is. It really is incredible what you can do with a few clicks. For the Facebook Ads connoisseurs reading this, who may be starting to turn their nose up at me, please take into account here that our organization heavily leverages digital advertising across a variety of platforms, and we spend quite a bit of money in order to utilize these platforms to achieve our mission. For the record, we LOVE Facebook Ads, and we definitely do use the more robust ads interfaces like Ads Manager and Power Editor. And for the record, we have run pretty much every type of campaign under the sun at various times, including Lead Gen campaigns, Video View campaigns, Conversion campaigns, Traffic campaigns (website and Messenger), we use re-marketing, Offline Conversions, tons of custom audiences, all sorts of placement combinations, and a wide variety of creative. We do all of that fancy pants stuff! And yes, we still love to boost Facebook posts. 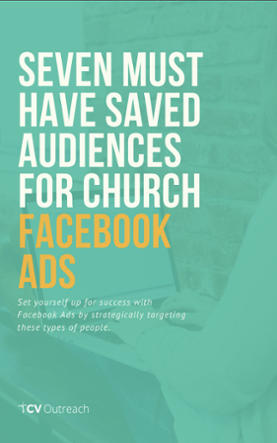 The usual pitch for churches who are pre-Facebook ads, is that you could reach a whole lot more people through Facebook Ads for a fraction of the cost, than you could if you spent it on print marketing. This is true. Print marketing is expensive and hard to track, and Facebook Ads are cheap and provide you with tons of metrics. 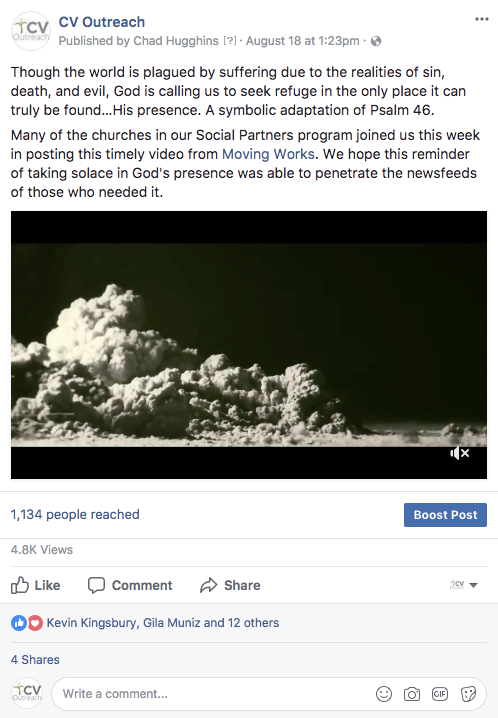 There are a lot of different objectives, or ways to use Facebook Ads, but for whatever reason, most churches just want to see a lot of people "reached", that is people who saw their Ad. They also, sometimes want people to go to their website. Both of these are very basic metrics, and both of these objectives are easily achieved through a Facebook Boost. First, what is a boost? A boost is when you click on that blue button in the bottom right of one of your published posts. It allows you a quick way to target people and spend money to get more people engaging with your content. One of the main takeaways from using a boost is that it's EASY. So, if you don't boost, what's the other option? The other option is to use Ads Manager, or Power Editor (which is a similar interface but designed for making bulk changes to multiple campaigns). These interfaces are a little more intimidating. They look something like this. One of the main observations here is that this interface requires at least a little bit of time to LEARN IT. Let me just repeat this subheading for you. Pastors don't need to be marketing experts to use Facebook Ads effectively. One of the main struggles with digital strategy that we hear from our partners is a lack of time. When you look at the two interfaces above, it's pretty obvious that one would require more time than the other (especially in the beginning). 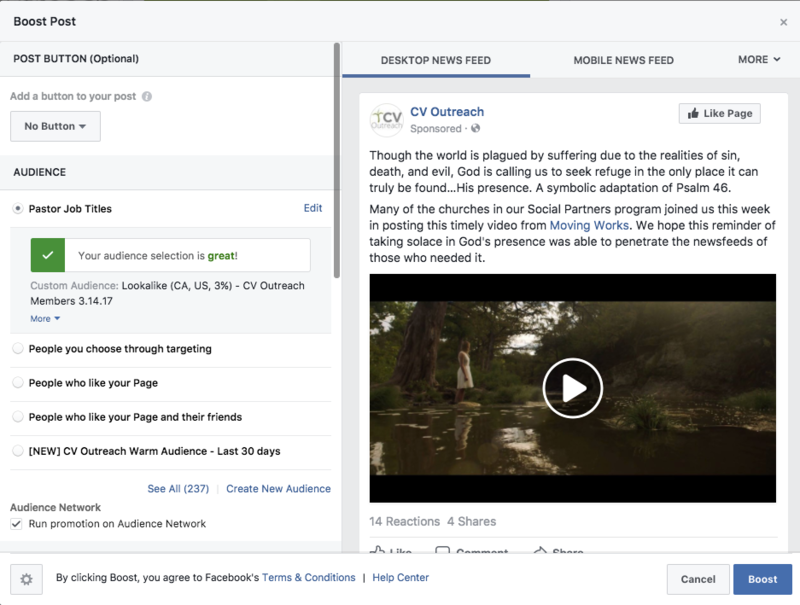 If your church is wanting to leverage Facebook Ads to reach more people, you do not need to use Ads Manager. Sure, there are more things that you can do with Ads Manager. You could split test creative. You could test out various audiences. 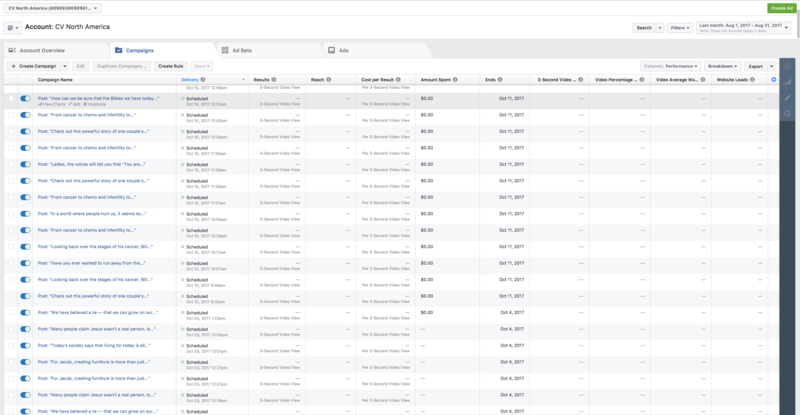 You can monitor your Ad Sets and budgets. But how much time to do you really have? I've always said that the most valuable thing that a pastor can spend their time on to help their church's digital strategy is create content. That's especially true here. If you have five hours a week to spend on Facebook, spend 4 hours and 50 minutes making awesome, original, heart felt, specific content, and 10 minutes boosting that content to the right audiences. It's a dangerous precedent to set that a pastor should be adept at platforms like Facebook Ads. These platforms are constantly changing, and require a fair bit of ongoing self-education to fully understand and effectively use them. Why would you want to commit to something like that? Especially when Facebook has taken the most broadly used, and most obviously effective features of the Facebook Ads platform and put them in the most easy to use interface on the platform. The boost is your totally justifiable excuse to NOT spend a ton of time on your Facebook Ads. 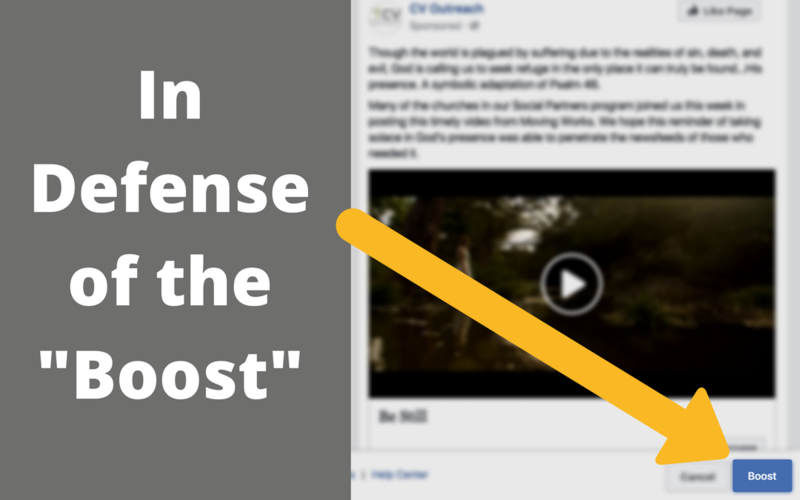 A Boost is a Facebook Ad of a specific, already existing post on your Facebook page. 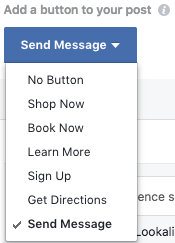 When you click the little blue button, you get an interface with a bunch of different options. In the past, boosts got a bad wrap, because the options available in this interface were very limited. Now, however, Facebook has given you quite a bit of levers to pull through the boost. You can spend as little as $1/day through boosting. You can set your boost to run for any period of time starting from the moment you boost it. Oftentimes people will ask how much money their church should spend on Facebook Ads, and I always say that you should start with $1/day. Why not? Use the smallest budget possible and see what it gets you. You might be surprised. Once you get more confident, you can work up to higher budgets that are commensurate with more developed digital strategies. Everyone thinks about the Newsfeed when you think of Facebook Ads, but there are actually a lot of different placements for Facebook Ads. The Audience Network is one of the biggest placements that Facebook has. It's a network of third-part mobile apps and mobile sites that are utilizing the Facebook Ads network to monetize their content. So, through the Audience Network, your ad might show up on something like Candy Crush, and in the Instant Articles that news organizations post on Facebook. For certain content, you can also include Instagram as a placement. Your Facebook Page and your Instagram account need to be connected first, but this is an easy way to get in front of certain types of people that may spend more time outside of the Newsfeed than in it. This button allows you to include a place for the people who see your boosted post to take a next step. You might want to drive them to your website, to your Page's Messages, or even to a map with driving directions to your church. This button is in addition to your originally posted content, and once you add it, it stays connected to the post even after the boost is over. This is what makes Facebook Advertising special. Audiences are a way to make your boosted post show up to people who are in certain demographics, who live within a certain area, and who are interested in certain things. Facebook has thousands of data points on each user, and through Facebook Ads, you are able to leverage all of this data. So, with Audiences you can make sure that your Boosts are putting your Content in front of the people that would like it or want to see it. This usually results in a more cost effective Facebook Ads strategy. To me, the main benefit of boosting posts is saved time. We could accomplish the exact same thing as a boosted post through the Ads Manager or Power Editor, but why would we? Facebook is letting us accomplish leverage their platform in an incredibly powerful way, and you can literally do it from you phone, with one hand, while watching football. It's that easy! So, what should you expect if you start boosting some of your Facebook content? This article is mainly about the function of the interface itself. There is a lot more high level strategy we could talk about around Facebook Ads that has to do with setting proper goals, creating appropriate content, and targeting the right people. But, at the very least, even if you are just testing the whole Facebook Ads thing out, you should see a "reach" number that is far greater than what you could accomplish through other channels comparatively. Will you magically have a bunch of new visitors show up to your Sunday service? Probably not (and if someone tries to claim that this is happening for them, we'll have to have a talk about correlation versus causation). But good digital strategy is a marathon, not a sprint. Your main resource in this marathon is your own stamina. Don't exhaust yourself on the things that don't yield you the best results. The boosting interface, since it is so simple and easy to use, is giving you a sustainable strategy to save you precious time as you seek to keep your church at the digital water cooler (in addition to everything else you have to do). So, the next time someone tells you that boosting isn't good enough, just send them a link to this article. If they haven't already seen it from the boosts I'm running right now ;).